Get affordable Security Camera installation Bellflower, CA and CCTV equipment with commercial quality and 2 years warranty. Protection4Less is experienced in the design, installation and servicing of security camera systems. Our systems goes from 4 to 64 security cameras, we can customize a security camera system that is right for you, and your budget. We have digital NVRs (network video recorders) and analog TVI-DVRs. Security camera systems are not just for the wealthy anymore. Anyone with a low budget looking to protect their home, or property can buy security camera equipment. A few years ago 8 security camera systems with installation was about $3,600.00, at this time is around the half of that price. Consumers can find a security camera system in electronic stores, but also on line. 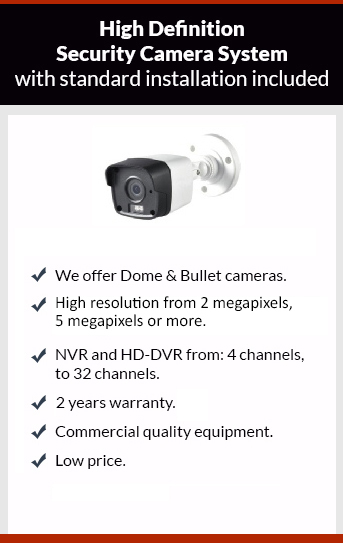 Buying video surveillance equipment doesn’t require a lot of technical knowledge, that’s Protection4less job. You have to focus only in your needs; we focus to provide the best solution to them. Give us a call, the estimate is free.